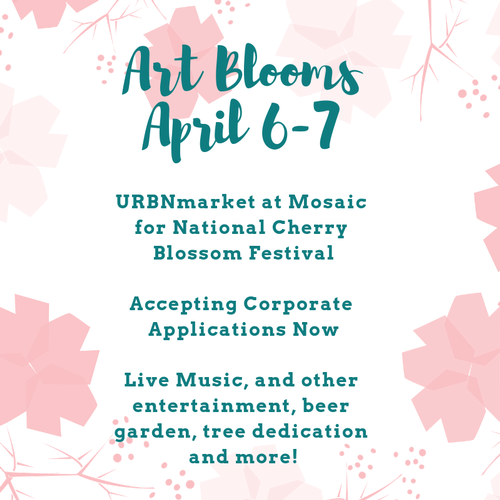 Name: URBNmarket partners with Mosaic for the National Cherry Blossom Festival - Art Blooms at Mosaic-Now Accepting Corporate Applications! In conjunction with the National Cherry Blossom Festival, Mosaic and URBNmarket will be bringing ?Art Blooms? to the Mosaic District on Saturday April 6th and Sunday, April 7th. This is a great opportunity to highlight your brand in the Greater Merrifield/Fairfax area and beyond! URBNmarket is now accepting applications for corporate vendors to participate with us. URBNmarket caters to a diverse crowd of shoppers including locals, tourists, families, and business owners. Exposure at Art Blooms is a brilliant way to inform our shoppers of your brand while building trust within our community.